Last year I was driving down the road and my engine oil pressure gauge all of a sudden got possessed. After a few hours in the shop I found that the factory sender switch was bad. After replacing it and have it go twice more on me since then I decided I needed to get a real oil pressure gauge instead of relying on that factory idiot indicator. So I bought a kit for around $15 at a discount auto parts store and here is what I got with it. I chose this one because it was only a couple of bucks. The way I see it is that it is cheep insurance. This gauge will allow you to monitor the oil pressure at a more accurate level then the factory “Ya I have pressure, crap now I don’t” . The only other items that are not supplied in the kit is a run tee and an adapter. These too you can also get at the local parts store. I chose brass because they are cheep also. 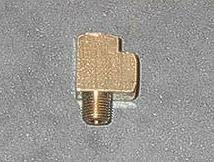 The tee should be a 3/8 NPT (National Pipe Taper) thread, and the adapter should be a 3/8-1/4 NPT. Disconnect the wire going to the OEM sender and remove it with a large open end wrench. 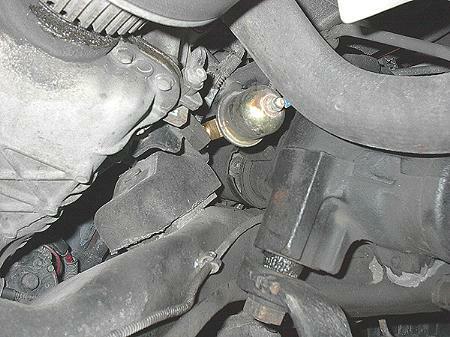 The OEM sender is located on the front of the block on the drivers side, just above the oil pan mounting flange. Clean the gunk off the sender with a clean rag. Then with a bit of pipe dope, (that is what I used but Teflon tape can also be used), apply it to the outside thread of the sender and thread it into the brass run tee. Tighten it down snug. The thread does not have to be all the way in the tee. Now with a bit more dope (or tape) apply it to the exposed thread of the tee and insert this into the stem that the original sender went to. Tighten down and orient other opening in tee to the front of the truck this way you’ll have lots of room to install the real gauge. Now with a bit more dope (or tape) apply it to the new senders thread and thread on the adapter, now apply some to the other end of the adapter and insert into the run tee and tighten down snug. With this done the original sender wire can be re-attached. Now the fun part. Trying to decide where to mount the new gauge. I chose to mount mine in the middle of my new console I just made. With the kit there is also an L bracket that can be screwed to the bottom of the dash and the gauge can be mounted in that. 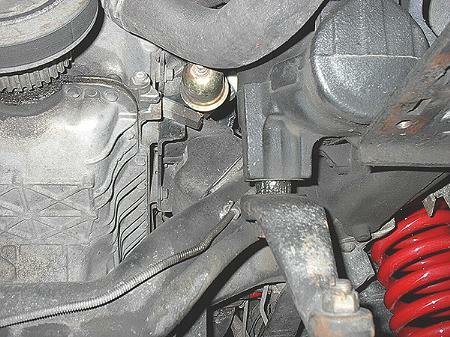 Finding a positive ignition wire in that area is easy. I just tapped into the radio ignition wire. I gather by now you have been smart enough to disconnect the battery otherwise you could be in for a shock of a lifetime. If you wanted to be crafty you could wire it up to the fuse block and then have a singular fuse for it. I chose the easy way. While I was there behind the radio I tapped into the radio light wire so that I had light to the gauge when I turned the lights on, and the radio ground wire. With these three wires in hand all I needed to do was attach them to the gauge. There is a positive terminal, a negative terminal, and the sender terminal. The hole in the gauge is for the light. The black wire from the light I connected this to the negative terminal on the gauge along with the ground wire from the radio. I then attached the positive wire to the positive terminal on the gauge and crimped the light wire to the white wire from the light. With a fair size length of wire I attached it to the sender terminal on the gauge. Now with every thing attached to the gauge it can be installed with the supplied U bracket and hard ware. If you want the pro look take some wire loom and wrap it around the wires to make a nice looking harness. The last wire to hook up is the sender wire. Find a nice place to route the wire through the fire wall. Right next to the main harness is a good spot. If you have to drill a hole then make sure you have a grommet in there to protect the wire from the exposed metal. Hey, make sure that the hole is small enough, you don’t need a 1 inch hole for one 18 GA wire. Using zip ties where possible, run the wire to your new sending unit. Now that the gauge is installed it is now time to hook the battery back up and fire up the engine to see if it is working. Also check to see that the light comes on with the light switch. If it is working then it should read about 40-45 PSI at idle. Take the truck for a run around the block to get all the air out of the sender. At a cruising speed I found mine to jump to 60 PSI. You can now sit back and relax knowing that your oil pressure is being monitored with a more accurate number rather than L or H.